Bundle your landline and home broadband and save £100s. 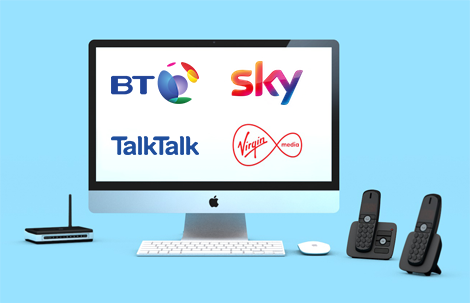 Compare the latest broadband and TV deals from Virgin, Sky, TalkTalk and BT. Don't need a landline? No problem. Check out these broadband-only deals. Looking to save? Check out our cheapest broadband offers. Check out the UK's fastest fibre-optic broadband packages. Need Wi-Fi on the go? Check out our MiFi mobile broadband options so you can get connected no matter where you are. Whether you're after high speeds, low prices or short contracts, we've rounded up our best TV and broadband deals for students.